The Stop the JNF campaign in Canada has recently had some successes. Since a story critical of the JNF was published on the Canadian Broadcasting Company and a parliamentary petition posted on 9 January 2019 in support of the complaint filed to the Canada Revenue Agency (CRA) and to Ministers of National Revenue, Noam Chomsky and Diana Buttu signed among the 1400 signers. JNF canada has finally put out a statement: https://jnf.ca/jnf-canada-responds/ and here is an Independent Jewish Voices op-ep in the times of israel: https://blogs.timesofisrael.com/why-were-taking-on-the-jewish-national-fund/ in support of Stop the JNF – Canada. The JNF continues to serve as a global fundraiser for Israeli ethnic cleansing, occupation and apartheid. Despite its historic role in a State institution of Israel (the Israel Land Authority) and in institutionalized racism and apartheid, the JNF and its affiliate organizations enjoy charitable status in over 50 countries and many also enjoy consultative status with the United Nations. In addition to the ongoing struggles against the JNF-KKL in Palestine, the campaign is underway in Canada, France, Britain, South Africa and the United States. The film Enduring Roots: Over a Century of Resistance to the Jewish National Fund directed by Alex Safron details the history and workings of the Jewish National Fund as well as historic and ongoing Palestinian resistance to the colonization of their land. Click here for more information or to arrange a screening. Plant-a-Tree in Palestine: a joint project of the Middle East Children’s Alliance, Stop the Wall, the Palestinian Farmer’s Union, and the International Jewish Anti-Zionist Network. Visit Fallen Donors Renounce Our Role in the JNF to see powerful testimony from former donors about why they now commit to exposing and confronting the JNF. Posted November 28th, 2013 by Stop the JNF Campaign & category Stop the Jewish National Fund Campaign, Uncategorized. "On 24th of June, the Israeli Knesset approved the Prawer-Begin plan,which if implemented will result in the destruction of more than 35unrecognized villages in Al-Naqab and the forced expulsion and confinement ofmore than 70,000 Palestinian Bedouins. The Prawer plan is the largest Israeliland-grab since 1948. It epitomizes the nature of Israel’s policy;Israeli-Jewish demographic expansion and Palestinian-Arab demographiccontainment." The Boycott, Divestment and Sanctions Movement has put out a call for a Day ofRage and action against the Prawer Plan and the Jewish National Fund, a funderand leader in the effort. The Stop the JNF Campaign supports the call for a Dayof Action on November 30th by calling for TWO DAYS OF ACTION on November 29th,called Black Friday in the U.S., and November 30th. JOINUS IN HANDING OUT THE DOWNLOADABLE FLYER toeducate people about the role of the Jewish national fund – U.S. in the forceddisplacement of the Bedouin and attempt to settle their land by relocating over250,000 Jews from the united states. Encourage them to take action by signingthe downloadable petition. The Day of Rage is being called for by Stop the JNF Campaign member groups – the International Jewish Anti-Zionist Network, the US Palestinian Community Network and the Middle East Children Alliance. If you are planning an education/outreach activity, pleaseemail us at stopthejnfcampaign.us@gmail.com, so we can promote itand let those who put out the call from Palestine know about the solidarityactions. Please also sign and forward this electronic petition. Posted August 22nd, 2013 by Stop the JNF Campaign & category Israel's Worldwide Role in Repression, Stop the Jewish National Fund Campaign, Uncategorized. 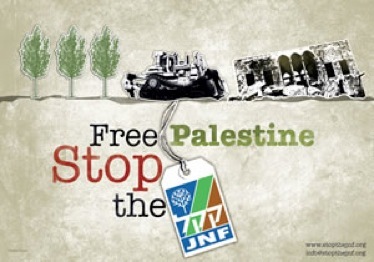 Posted July 22nd, 2013 by Stop the JNF Campaign & category Israel's Worldwide Role in Repression, Stop the Jewish National Fund Campaign, Uncategorized. Members of IJAN attended the Left Forum in New York andpresented two workshops. On Saturday IJAN members presented on theinternational Stop the Jewish National Fund Campaign featuring participationfrom the U.S. and Canada. On Sunday, IJAN presented with Al Awda – NY, the NationalLawyers Guild – NY, the Center for Constitutional Rights, and the Malcolm XGrassroots Movement on Israel’s Worldwide Role in Repression. Stop the JNF Campaign Growing in the U.S.
Posted July 22nd, 2013 by Stop the JNF Campaign & category Stop the Jewish National Fund Campaign, Uncategorized. The Campaign to Stop the JNF is growing in participation,visibility, and momentum. This spring, Jonah Aline Daniel represented the Stopthe JNF campaign in many cities across the Midwest and East coast of the United States to bring areport back from the Plant-a-Tree in Palestine delegation. The tour was a success indrawing crowds of various sizes, recruiting new campaign activists andprompting many helpful questions to further the strategic development of theCampaign. At each event most people signed postcards bombardingthe IRS with demands to revoke the charity status of the JNF. Many peoplesigned up to stay in contact with the campaign moving forward. There was muchinterest in increasing knowledge about the JNF across environmental movements andin a legal campaign against the JNF. Here is the Stop the JNF Campaign presentation thatwas used on the tour and is available for use by Stop the JNF activists. The Stop the JNF Campaign created this shortvideo as an introduction to the true purpose of the JewishNational Fund. It was screened at every location on the Report Back Tour and isavailable to share with all of your networks. Additionally, the Stop the JNF Campaign was invited to submit adocumentary film this fall about the Jewish National Fund and theresistance to it at the Zochrot Film Festival, Nakba and Return, in Tel Aviv.This film will be made available to Campaign activists to use in our educationwork and to expose the historical and ongoing role of the JNF in thecolonization of Palestine. Posted May 29th, 2013 by Stop the JNF Campaign & category Stop the Jewish National Fund Campaign, Uncategorized. Check out the website of the Stop the JNF Campaign for more information, updates and resources. Posted February 4th, 2013 by Stop the JNF Campaign & category NEWS & OPINIONS, Stop the Jewish National Fund Campaign, Uncategorized. Posted January 18th, 2013 by Stop the JNF Campaign & category Stop the Jewish National Fund Campaign, Uncategorized. Posted January 12th, 2013 by Stop the JNF Campaign & category Stop the Jewish National Fund Campaign, Uncategorized. This is the first in a series of updates from IJAN participants in the Stop the JNF Campaign and the Plant-a-Tree Delgation. The Plant-A-Tree in Palestine Project is a joint project of the Middle East Children’s Alliance, Stop the Wall, the Palestinian Farmer’s Union, and the International Jewish Anti-Zionist Network to support the on-going struggle of Palestinians to rebuild by providing resources for villages to plant trees that are indigenous to Palestine’snatural environment and agricultural life. Participants in the delegation will plant the trees with community members joined by their fellow Palestinians. They will spend a day replanting trees in villages and homes that had their trees uprooted by the Israeli military and/or the Jewish National Fund. Return to the website to view further updates.